This topic contains 2 replies, has 1 voice, and was last updated by Allan Burgess 3 years, 9 months ago. For many years I always used treble Hooks for kahawai, salmon, and on my trout spinners. For the past few years I have used singles only for kahawai fishing in the surf and at river mouths. I’m sure the single hooks actually result in far more hook-ups and far fewer lost fish. I’ve found either a 1/0 or 2/0 Mustad 34007 O’Shaughnessy hook to work well. Unlike Kirby hooks with their offset points the Mustad 34007s are straight. 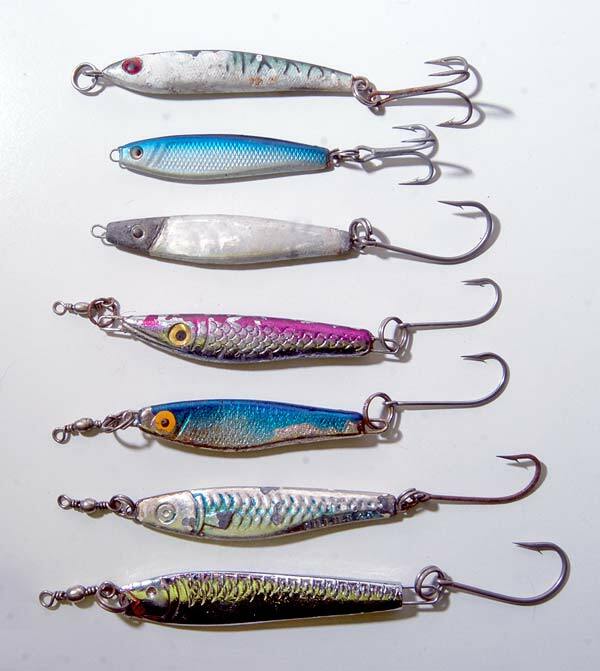 I reckon the best casting lure for kahawai is one that is all silver with perhaps a blue back armed with a 1/0 hook. Something like a Gillies which is a little flattened. In 40g these cast extremely well. What do you think is the best kahawai lure? Do you prefer a ticer? If I can take a picture on my phone and upload it to this forum I’m sure anybody could. Even if glo-bugs have nothing to do with single or treble hooks!